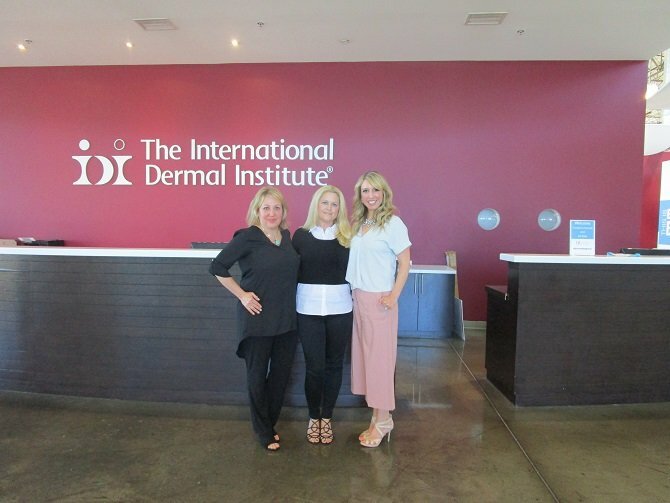 Two Advance Beauty College Students Win Dermalogica’s Grand Prize in a recent Retail Contest; furthering their career potential with exclusive behind the scenes tour, training, interview and photo/ video op on the IDI website. The Laguna Hills, CA —May 5th, 2016— Advance Beauty College and Dermalogica announced today that Jill Eller and Candice Hanchett earn the Grand Prize for the recent Dermalogica Retail Contest. Advance Beauty College, Orange County’s popular and highly recommended beauty school, was proud to participate in Dermalogica’s Retail Contest this past month. The event took place from March 29th to April 16th 2016, allowing students from Advance Beauty College the opportunity to compete for a grand prize awarded to two selected students. Dermalogica, widely recognized as number one for consumers and skin care professionals around the world, has made quality products and mastering a healthy skin care regimen accessible for all. As a Dermalogica Partnership school, the retail contest allowed Advance Beauty College to provide further hands on experience for their students and introductions to industry leading professionals. All students studying skin care or esthetics were eligible, selling a minimum $1000 of full priced retail Dermalogica products to qualify for the grand prize. Contestants needed the highest sales to win. Advance Beauty had students participate in the Dermalogica Retail Contest and is proud to announce 2 students from the beauty school, Jill Eller and Candice Hanchett, were chosen as the 2 winners. Advance Beauty students participating in the Dermalogica Retail Contest, Jill and Candice, both study esthetics. Both students got the chance to interview in front of the Dermalogica camera be part of a video shoot. Additionally, the two winners have the exciting and rare chance to have media coverage on a Dermalogica press release, photo ops and be featured on the IDI (International Dermal Institute) website. Earning an undergraduate and MBA degree the traditional route, Jill went on to work at Phifzer as a pharmaceutical representative for several years before considering a career change. Teased by family about “lotions and potions,” contestant winner, Jill decided to look into skin care. After researching and learning that Advance Beauty College was highly recommended, Jill became interested in the Orange County Beauty College located in Laguna Hills. The emphasized hands-on experience with industry leading products, such as Dermalogica skin care products was an added bonus to Jill’s study. Jill finds that the hands-on-training at Advance Beauty College on Dermalogica products are of the best standards; learning techniques on micro exfoliation, pre-cleanse, soothing and other essential skin care regimens. After attended Advance Beauty College and trained with one of its top educators, Suzette Christian, Jill feels that she is truly prepared to take on this new and exciting career. When asked what advice Jill would give to new students, she said, “Embrace change, market yourself, and don’t be afraid to push a product, because they will buy it elsewhere”. The Dermalogica retail contest’s other winner, Candice had severe acne in her early years. She decided to take the extreme route and take Accutane (isotretinoin – a drug designed to help diminish severe acne). Then during this time, while on the medication for her acne, she went to a dermatologist. By seeing the care and how her doctor’s visit affected her life, she then fell in love with skin care and wanted to become a skin therapist. Candice attended a different esthetics school in Orange County, however the school closed down. As a result, she heard many recommendations to Advance Beauty College of Laguna Hills. Many of the existing students told her she was in “good hands”. The added value to the college was that it is a Dermalogica partner school. At Advance Beauty College, Candice appreciated the professionalism of the beauty school as well as the protocol she learned for treatments on clients. Retail sales of the students participating in the Dermalogica retail contest were tracked starting Tuesday, March 29 through the end of the day Saturday, April 16th. The two selected winners, Jill and Candice received the grand prize. The “Dermalogica Experience” grand prize package included a press release, photo op and feature on the International Dermal Institute website, behind the scenes tour of Dermalogica’s US Headquarters, gift basket of incredible Dermalogica products, a 1-hour skin treatment for International Dermal Institute or Dermalogica, and the chance to participate in a Dermalogica video shoot. Advance Beauty College students participating in the Dermalogica retail contest, Jill and Candice, also received the incredible opportunity to attend a VIP lunch with Annet King and Dr. Diana Howard. Anne King, director of global education for the International Dermal Institute, is both CIDESCO, ITEC and CIBTAC-certified in massage therapy, skin care, aromatherapy, and reflexology. Raised in the United Kingdom, and completing over 20 years of skin care and teaching experience, has allowed Annet to transform the skills of American-trained therapists to the level of fellow therapists overseas, therefore matching international standards as well. Dr. Diana Howard, VP of Research & Development and Global Education for Dermalogica and the International Dermal Institute, highly contributes to Dermalogica’s success, bringing her expertise as an ingredient innovator, educator, researcher, author, and lecturer. Dr. Howard earned a Ph.D in Plant Biochemistry from UCLA and continues to make changes in the industry, for example taking a “fusion” approach to formulation, incorporating hybrid compounds with ingredients created in the lab. Please visit https://advancebeautycollege.com/laguna-hills-advance-beauty-college/ for more information on student events and how you can gain experience with Dermalogica products, benefiting your future career in the industry.